The Long Beach Post Person of the Year cover, aka the Sea of White People. Photo courtesy of Samuel Lippke. According to Williams’s logic, bicycling within the black community is viewed as child’s play: it isn’t for adults. Leaving one’s bike behind represents, on a certain level, graduation into adulthood. This social stigma perpetuates stereotypical success in very Southern Californian terms, where your car soon becomes a symbol of your well-to-do-ness–something which Williams feel is doubly intensified within the racial minority communities. As she bluntly puts it: it just isn’t normal. “I will be riding and black families will just stare. I wave–what else am I to do?–but we have to alter this perspective,” she insisted. And just as bluntly: it’s because we choose as a community not to normalize it through images and advertising that cater to a specific, limited audience. And it’s not just the street banners. Newspaper ads lack showing large families with more than one child. The large ads spread throughout Long Beach Transit buses showcase a 1950s-dressed white woman driving an refurbished classic convertible in pristine condition while sharing the road with a variety of bicyclists. The altering of this perspective isn’t simply about getting more people on bikes. As many advocates know, one can’t simply approach a community and say, “This is good for you so do it,” and the people will follow. If that were the case, the gap between marginalized groups versus that of the more affluent wouldn’t be so alarming. In other words, the needs and challenges of these outlying communities are markedly different than those the city currently caters to; biking isn’t just for leisure but for daily survival. Marked difference in social determinants–such as poverty, low socioeconomic status (SES), and lack of access to care–sadly increase rates of obesity, diabetes, heart pressure, high cholesterol, and various other medical and health issues which plague these oft-ignored communities. For Williams, the possibility of at least lowering such problems revolves around altering perceptions as much as providing access: a separated bike lane doesn’t encourage much when one doesn’t know the point of it. In the consensus of many, all that bike lane did was remove parking and limit the ability to drive faster down a street. In this vein, reflecting the U.S. health care problem where money is geared more towards technology (e.g. devices and drugs) rather than equity, Williams sees money geared more towards infrastructure but not programming. With sophisticated incentive programs–for example, Williams is set on providing free bikes with the caveat that those receiving the bikes become entirely educated in and graduated from a bicycle safety and knowledge program–paired with better information–for example, she discovered that the outreach was improperly done to the extent that only ONE person showed up to a community meeting in North Long Beach a year ago to discuss the bike plan–Williams hope that acknowledging the gaps will help lead to mending them. And the key is trying to inform people who already lack large amounts of monies that not only is the investment worth it for them, but it will increase their property value on top of alleviating other financial stresses as well, including dependence on gas, public transit, or general vehicle costs. 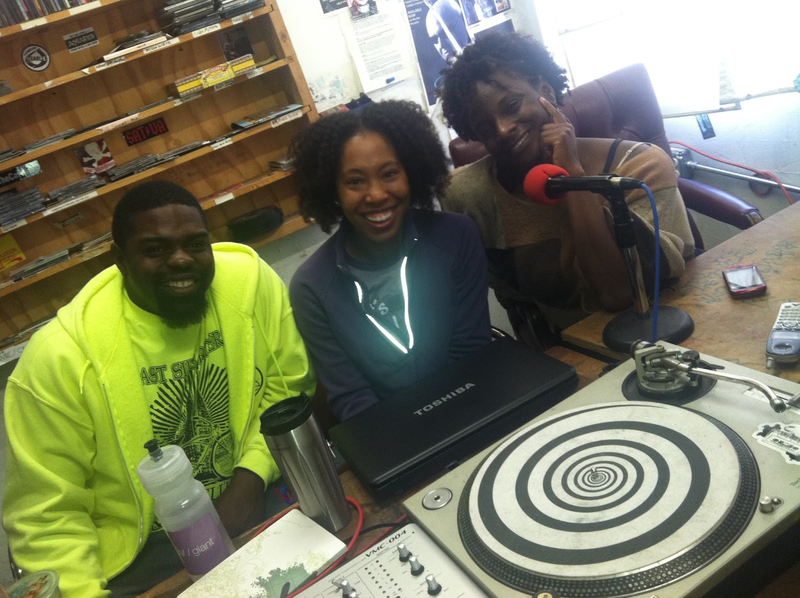 Elizabeth Williams (center) joins East Side Riders guru John Jones III (left) and Renee Jones (right) for Nick Richert's Bike Radio. Photo courtesy of Elizabeth Williams. That excuse includes safety, where a fear–not necessarily unfounded, particularly in unsafe neighborhoods–is deeply held by parents and guardians who are told they should permit their children to ride bikes. Inspired by John Jones and his phenomenal work with the East Side Riders, Williams feels that cohesive engagement–such as Jones’s work with local gang members to create Life Lanes that permit kids to ride in certain parameters in Watts with no fear of being attacked or confronted–with everyone from the Long Beach Police to neighborhoods overseers will override that fear. Even beyond the direct, individual health reasons, there are–as studies have repeatedly shown–deeper communal benefits that transcend safer roads: the more people seen walking and biking, the the more likely they’re to engage with their neighbors, notice businesses, and support local economies. If one were to theoretically provide these concepts to underserved neighborhoods, more people will engage with their neighborhood entirely as a whole–and Williams is deciding to just that this year, particularly given her new role as Bike Ambassador for North Long Beach. This spring, she hopes to begin surveying the neighborhood association events to find out about the citizens’ riding experiences, their feelings on bikes, and what would it take for them to ride a bike; she’ll then compile that data to begin creating programs such as the one that will offer bikes to those who choose to educate themselves in bicycle safety. How is it my problem that people of other races do not ride bikes in the same porportion as whites in this country? If someone chooses to purchase and ride a bike or not to do so is their choice, not mine or my responsibility. Here in the Chicago area and when I ride in Tucson, I see folks of all races on bikes and the rides are integrated as well, without prompting and dictates from politicians I might add. Please do not try to start a controversy where there presently is none. Seems to me that the only person around here trying to “start a controversy” is the one lashing out at the author for pointing out some pretty uncontroversial (that is to say, easily demonstrable and well documented) facts about the demographics of cycling in Long Beach, California. Long Beach’s Leap Towards Livabilty IV: Leaping Forward? Bicycling is for Everyone: The Connections Between Cycling in Developing Countries and Low-Income Cyclists of Color in the U.S.